For a creative and tech savvy couple (he works at Facebook and she is an independent artist) looking for a home in the City, high on their list was the wish to have a spacious in-home studio where they could engage in a variety of digital and analog works. When they spotted this four-story house in Bernal Heights, they saw the potential in the barely finished basement. But the access to this level was so tortuous that they rarely went down there during the first year after they moved in. So, when building Lab's designers suggested flipping all the stairs to the opposite direction to improve the flow, our clients jumped at the chance of radically transforming the building. The result is an open interior with distinct and yet connected spaces spreading through all four floors. Tailor made for a young professional couple's lifestyle, the house serves multiple functions as dwelling, work stations, artist studio, as well as entertaining venue. Elegant sets of stairs become the star feature that seems to enable the burring of the boundaries between work, play, and relaxation. mezzanine and garden level. The living, dining, and kitchen areas in the open room form an arc which is paralleled by the panoramic view of the city outside. Upstairs, an oversized custom pivot door leads to a small foyer that accesses the master bedroom on one side, and the master bath on the other. 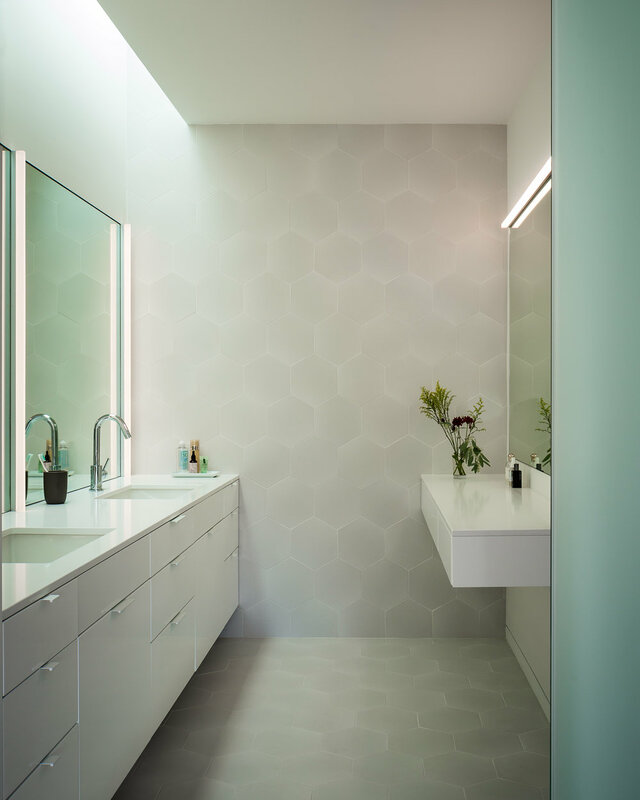 With walls and floor completely clad in pale grey hexagonal porcelain tiles and bathed in natural light, the luminous master bath is a study in less is more. Downstairs from the main level, a mezzanine floor is suspended to the joists above with a steel rod, with glass railings and a custom built work top running along its entire length. When working from home, our clients do their digital projects at this level, overlooking the dramatic space below with a two-story wall of glass. The lowest level is where our lady client does her physical studio art. She has her tools, books, and samples strewn all over the concrete floor. 10' high NanaWall® folding glass doors open up the entire space to the outdoor patio. Simple planting and seating, a custom fire pit, and strings of lights complete the picture for easy al fresco entertaining. Looking back up, the suspended floor above with the minimalist glass railings seems to have a dialog with the sleek dark wood stairs gracefully flowing down to earth.